So we're into week five of the schedule and things are ramping up. If you're not up to speed with what we're doing here, we've hooked up with Fitbit's ambassador Greg Whyte to start a training plan based on heart rate and enabled by wearable tech. It's been an eye-opening way of training and a good learning experience for the first few weeks. Read back through the first weeks if you're interested to know how I got started. Anyway, here we are at week four of the plan, and life is starting to get in the way. Running four times a week is hard, and a hectic travel schedule and a golf weekend was making it very tricky to plan. But with some sacrifices and a couple of early starts, I managed to get three of the four runs done. The first was the weekly 45 mins at marathon pace, which I got up before work to polish off. Nothing really eventful here, apart from holding the heart rate at 165 – and while I did get overexcited and finish at too high a bpm, the 8:40/min pace (20 seconds per mile up on my first trial run) makes me hopeful of a strong improvement for the MISO test in week six. It also reiterated how diligent you have to be to maintain your target zones, in case of turning all your data to junk. Run two was a 60 minute run with 2 x 10 mins at AT1, which is my half marathon pace. I had to polish this off in my lunch hour, and the heat had returned to London. With the mercury pushing 25 degrees I made the decision to just stay at the AT1 pace for 30 minutes rather than stay out in the heat for a whole hour. Would Greg approve? Unlikely, but to be fair I had no choice. I came back a dried husk. But the stats were promising: an average HR of 173 was lasered onto where I needed to be, and a pace 8.37 min/mile isn't too shabby either. While I had cut the run short, at least I had delivered on a good section of the required goal – and the heart rate tracking enabled me to do that. I couldn't fit in the 90 minute long run (I'm going to extend one of next week's 45 min runs into a 90 minuter to try and make some back) but I was determined to make up for last week's interval misfire. I'm lucky enough to have the wonderful Croydon Sports Arena near my house. So I took to the track to try Greg's prescribed 20(!) x 400m intervals with a two minute break between each. Heading onto the track was pretty cool, especially during the Olympics, which has left me feeling a bit inspired. That's a bit sad given my prohibitive age. I still couldn't believe Greg wanted me to do 20 laps of the track at this pace, and I was still muttering about it as I warmed up on the way down to the track. I thought of Team GB's wonderful Laura Trott and the rest of our great Olympians and figured this is what you have to do to achieve greatness – who I am to complain? Last week I explained the trouble I had figuring out how hard to run during intervals, but Greg kindly added some guidance this week. He wanted me to do my 400m in 1.30 or less. I worked that out to be an average pace of 6.2 min/mile or 3.45 min/km. Tough going for sure, but having a pace to work to was a comfort. So I hit the track and matched the pace. And it hurt. 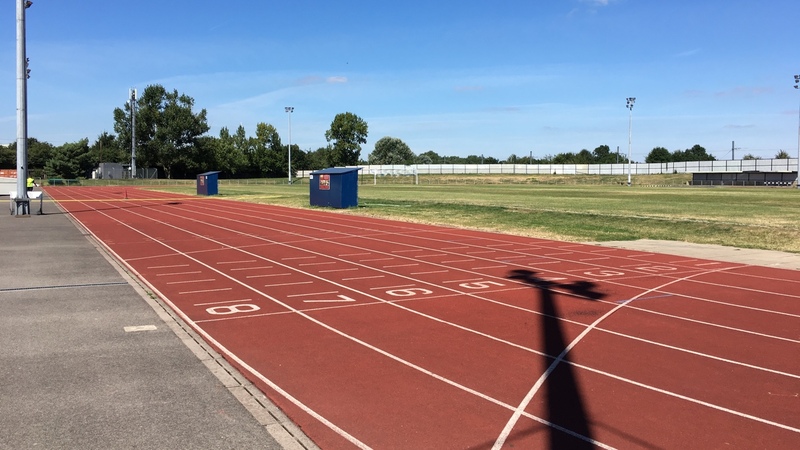 After 14 laps (annoyingly I miscounted and thought I'd reached 15) I called it a day and went home, the final lap felt like running in treacle, and my pace had dropped from around 6.10 min/mile to nearly 7. Also, I didn't take a drink out with me and it was another scorcher in London. The awesome array of stats from the Garmin Fenix 3 tracked the temperature at 27 degrees centigrade. I'm a little ashamed of flaking and Laura Trott would undoubtedly be appalled. But there were positives. Firstly, working out at a proper pace I could control made intervals a lot easier than a week ago, which was a total disaster. 6.20 min/mile is lightning for me, but once I could track my pace, it was much better. But what about heart rate? Well, this week only confirmed last week's theory that heart rate is a bit crap for interval. Given an interval lasted 1.30 in this instance, it took both my heart rate devices around 30 seconds to get up to pace. Then my heart rate climbed steadily through the 170s. By the time I get to my peak HR for the interval (around 180, surprisingly low), I'm stopping. Therefore, trying to track each interval by HR is nearly impossible. But a quick word on accuracy: this week I wore a TomTom Spark and Garmin strap. the average for the session mapped by TomTom was 156bpm and the chest strap tracked it an average of 153bpm. While neither are nailed on accurate, it goes to show that optical heart rate can perform, even during the rigours of HIIT. Next week we'll try the Fitbit Blaze. While I'm a total convert to tailoring my sessions to heart rate, because it's a clear indicator of the goal of a session, I'm finding it far more helpful to work these short burst HIIT sessions with pace. That said, there are things I can learn from my bpm. It troubles me that my heart rate didn't break 180bpm on a few of laps around the track. I felt I was pushing as hard as I could, but the evidence is there. I could have run harder. It's something to work on next time to ensure I'm getting the most from each session. So 6.2 min/mile is now my benchmark speed and I'll be forcing myself to topple 180bpm or higher on every burst. And I'll be heading down to the track (in the evening, with a Lucozade) to really push on with this side of the training this week.